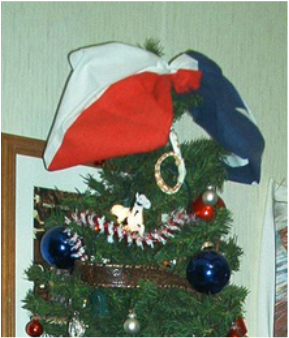 Texas Themed Christmas. Texas ornaments, stockings, tree skirts, lights and some DYI tips. Ornaments for Texas sports teams. It's no secret. I am from Texas, so who else better to help you find the best decorations for putting on a Texas Themed Christmas? I have rounded up the ornaments, lights and other decorations you can use for a little or a whole lot of Texas decorating. This Texas Santa is riding in style. He has a gold Cowboy Cadillac complete with horns for a hood ornament. This glass ornament is 5 1/2 inches long, 4 inches high and 2 1/2 deep. The car is full of Texas style goodies like cactus and guitars. These are Christopher Radko all glass hand-blown Ornaments designed with Texas in mind. Each has a Cowboy Santa painted in colors of the Texas flag. "Texas Ranger Nick" is a 6 inch glass ornament. It is hand blown, painted and has glitter accents. This Cowboy Santa with Texas at the bottom is made of resin. It is approximately 3 inches tall and 2 inches wide. Santa Is A Texas Cowboy! Enjoy the song and the crackling sound of an old LP . Santa is a Texas Cowboy. These ornaments come in a pack of 6. You get 3 of each style shown here. They are made of resin and are 3 inches tall. Pack of 6 Multi-Colored Western Hanging Decorative Christmas Ornaments 3"
Another nice looking set of Texas ornaments. There are 3 of each type included in the 6 piece set. They are 4 1/2 inched tall. Pack of 6 Red, White and Blue Texas Hanging Christmas Ornaments with Sayings 5"
For me, there are many things that come to mind when I thing of Texas. Some of these such as armadillos and chili peppers are represented as Christmas ornaments. This cute little Texas armadillo is made of glass. He is dressed in his Texas best including a cowboy hat and boots. This chili pepper is ready to hang. It would be a nice addition to you Texas themed decorations or a memorable gift for a friend who loves chili. You can make your own ornaments with cookie cutters. Below is a picture of my Christmas tree one year when I made the ornaments. I used a salt dough recipe and western shaped cookie cutters. Being short of a western tree topper, I decided to tie this bandana into a bow. 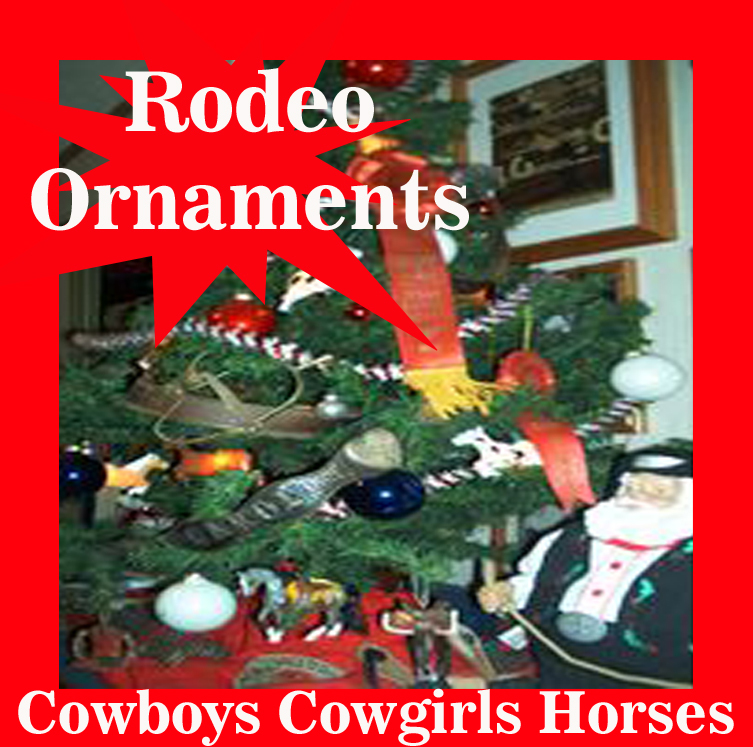 I secured it to the top of a small rodeo themed tree that I put up in the bedroom. 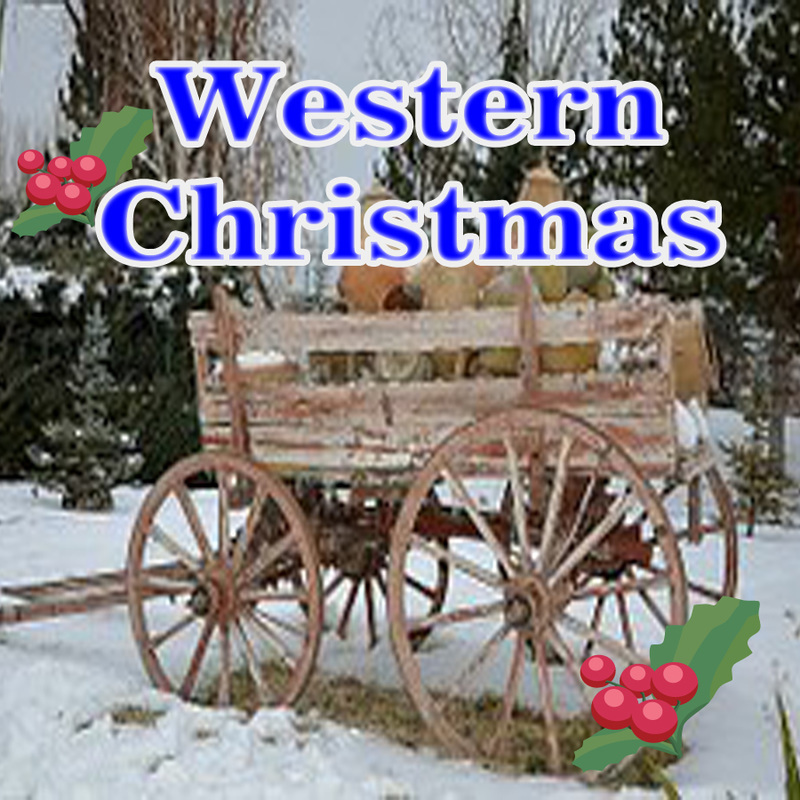 I used some western and rodeo themed ornaments, horse string lights, some ornaments from prior years and all sorts of western things from around the house. 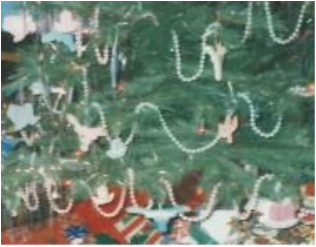 Dig out and red, white or blue ornaments that you have to finishing filling out the tree. Use a bandana as a bow for your tree or on a wreath. 100% cotton bandana that is 21 1/2 x 21 1/2 inches. To the best of my understanding, this is only for the Texas flag boot stocking. The other boot stocking pictured is not included. Cowboy Boot Stocking with Texas Flag Design - 23"
This stocking is made of brown felt and shadow velvet with the Texas flag star on the upper part of the boot. This stocking is made of bright red polyester fabric and has a fold down cuff. There is a sewn on detailed applique rodeo design of a cowboy riding a bucking horse and Texas lettering. ​There is a matching Christmas Tree Skirt. This is a 48 inch round tree Texas tree skirt. It matches the St. Nicholas Square Texas Christmas stocking or will coordinate with other western Christmas decorations. If you have been through Texas and forgot to pick up a souvenir along the way, you can find one here. There are Texas Christmas ornaments that represent the entire state and some for different cities around the state. This ornament features major cities in Texas and symbols associated with the state. Is is made of brass and measures 2 1/2 x 2 1/2. Texas is a state so great that there is a card game named for it. Texas Hold 'em fans will enjoy these ornaments and stocking to decorate with during the holidays. The ornaments are also be a fun gift that can be used to hang from a rear view mirror. ​Ornaments comes in a box and includes a ribbon loop for hanging. You can personalize it yourself with a marking pen or send your information by email to have it done for you. This is made of resin and has the King of Hearts wearing a cowboy hat. It is 4 1/4 inches tall and 3 inches across. Order this stocking early because it takes 1 to 3 weeks to ship. ir is made of red felt and had a large Christmas tree applique in the center with real playing cards and chips for detailing. You can find something pro and college sports. I have included one for an example, but there are many more.